The beveled mirror has met its match. Until now the beveled edge has been the dominant frameless mirror. Introducing the chipped edge mirror. The mirror that can be made in any shape or size. The shape of the mirror can be created in one of several ways. The first way is to cut the mirror to the size or shape of your pattern and then chip the edge. The second way is to cut a standard shape like an oval or triangle and chip. The third way is to start with a standard pattern and continue to chip the edges to change the shape of the mirror until it stops people in their tracks. Are you tired of being told you can't do that or we don't have that? 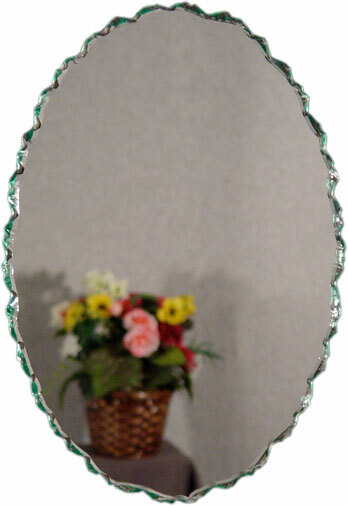 Specializing in oval mirror frames for over 25 years. Creating one of a kind piece's for you from your specifications and ideas. Each mirror is made by hand so that each one is slightly different and unique. If you need a matched set, I can produce them together. The light shines and dances off the edges, creating a dazzling edge for the mirror. The old style of glass chipping is to chip on both sides of the glass alternating from front to back. This is still a popular edge for glass table tops. My style of chipping is to chip the mirror from the same side. Both the front or the back can be done. It produces drastically different results. Chipping from the back removes the silvering leaving the raw edge of the glass to catch the light. Chipping from the front leaves the silvering intact and gives the light more reflection angles and space. Small chips at first and then random and larger "clam shell chips". Once the chipping process is complete the sharp edge of the mirror is seamed. This removes the razor sharp edge and makes it safer for you to handle and clean. This low-iron chipped name plate features a glass base. I have several sizes and shapes of glass plaques. Ranging from name plates to home established plaques. My work ranges from small gifts to large architectural pieces. From designing and creating architectural elements and geometric shapes to executing you artwork and logos. All my work is custom not massed produced. If you need privacy and light from your windows and doors, I can create designs that provide privacy and add to your interior design. 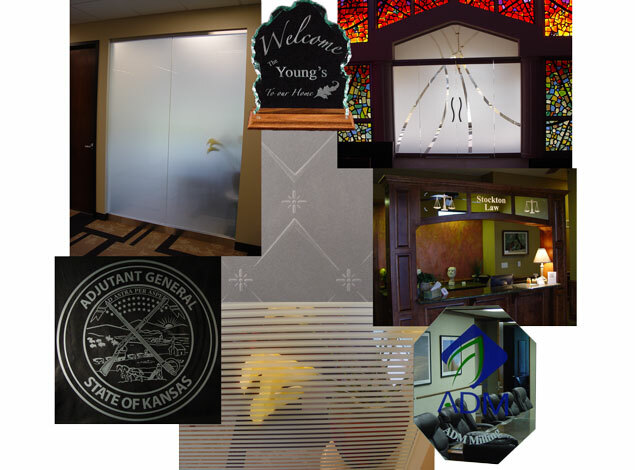 I can customize name plates, vases, coasters, home established plaques, signage, windows, glass doors, sidelites, transoms, glass partitions, mirrors, glass kitchen back splashes and cabinet glass. The possibilities are endless.